BEST. RACE. EVER. 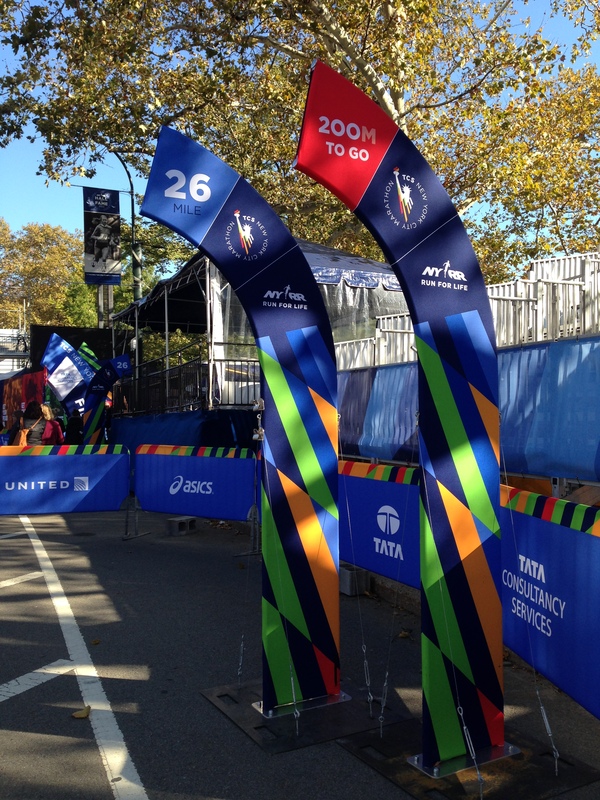 It’s been a few days since the marathon – my body aches already gone but the runner’s high still lingering. What a phenomenal experience! Being surrounded by thousands of amazing runners, volunteers, spectators , and fabulous entertainment was so exhilirating, it made me ignore the occasional 30mph winds blowing me in every direction. 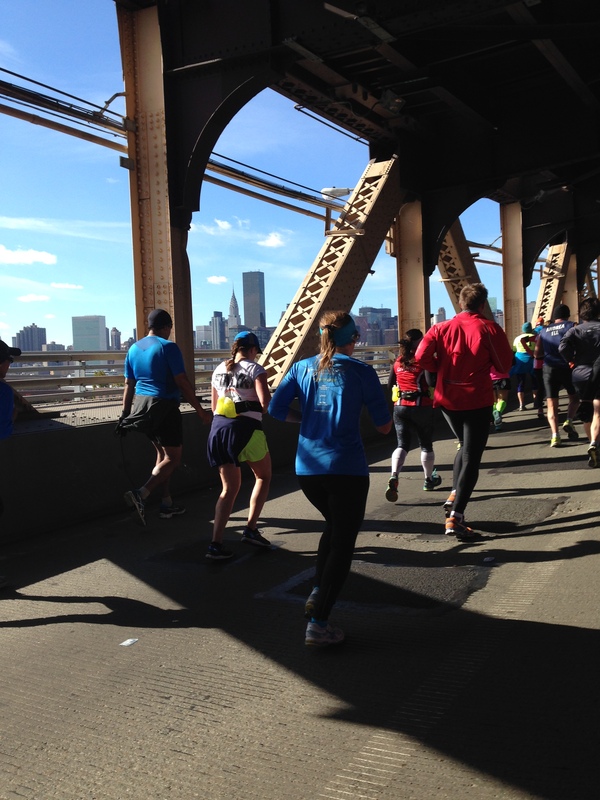 The course through the 5 boroughs was a delightful journey of various sights and sounds. When I crossed the finish line in Central Park it gave me such an emotional high, I did not want the race experience to end. I didn’t PR nor did I reach my 4 hour goal time finish, but I ran the best I can and pushed my body to perform beyond its limits. This was my comeback marathon after a 5 year break (2 kids later) and I could have not asked for a better race. My plane landed at JFK on a Halloween afternoon. Unfortunately I had to gate check my oversized backpack and those bags didn’t find their way to baggage claim until 45 min after the flight arrived. But while I was waiting, I spotted an elite marathoner, Shalane Flanagan who didn’t run the race but was probably there to support the rest of the runners. She was not difficult to spot wearing bright blue leggings and a green neon Nike backpack. I wished I had the guts to stop her for a pic but she probably just wanted to get out of the airport. I was even more excited to be in NY after seeing her. By the time I picked up my backpack, it was already 4:30pm – I knew it was an hour’s worth to take the AirTrain then the Metro to midtown Manhattan. Originally, I planned to go to the expo on Saturday but I reconsidered thinking it would be less of a crowd if I went later that night. 7pm was the cutoff time for bib pickup and the expo was open until 8pm. Fortunately, with the Iphone’s assist, I navigated my way to the hotel using public transportation without a hitch. It was actually simple which eased the built-up anxiety I had beforehand with having to travel alone. I checked in at my hotel to be greeted by an awesome view of the Chrysler building from the balcony of my room so I sat there for awhile to relax before going to the expo. One of the perks for running NYC is the convenience of a shuttle ride to the expo from various points in Manhattan. I stayed in a hotel near Grand Central Terminal which was a pickup/drop off location for the shuttle. It was already 6:15pm when I boarded the bus. Even with traffic, it was only a 15-20 min ride to the convention center. I made the right choice to go to the expo Fri night – no crowds to be seen. It took me 5 min to pick up my bib, shirt and goodie bag and spent only 30 min browsing through the different vendors. I was quite exhausted from the flight and wanted a good night sleep. Without the kids around, I intended to sleep in until my body was ready to get up. Unfortunately, as they say NY never sleeps and even though I had a great view, the door to the balcony welcomed the outside noise which meant car horns and police sirens. Eventually, I settled into a deep slumber and didn’t wake up until around 9am – the latest I’ve slept in years. Saturday was an uneventful, rainy day. I jogged less than a mile to a breakfast joint to see how my body was feeling since I only managed to run on Tuesday with the track club. No pain and I felt good. Spent the afternoon shopping for souvenirs/gifts for my girls, my hubby and my in-laws who visited to help watch the girls while my husband was at work. I’m blessed to have a supportive family. And surprisingly, I also received a text from my mom to tell me she and my dad will be taking a bus to NYC to watch me run. Such great news. By dinnertime, I was tired yet again. I had an early dinner with a mom from San Diego whom I met via email through a mutual friend. Almost like a blind date! But it was a nice dinner and great conversation so I’m glad I had that opportunity to hang out with someone else who was running the marathon. However, the rest of night is a story of its own. In my attempt to save money, I decided to book a room at the military hotel with the condition of having to share a room with others. I was under the impression it would be only one other person or no one at all, but unfortunately, I had to share it with two other females. Let’s just say, I had zero sleep and 0530 did not come soon enough. I was desperate to get out of the room, I wanted to leave by 0330! RACE DAY Sunday 🙂 Brrrr, windy and cold. I had a long sleeve shirt under my SDTC singlet, shorts, leg compression sleeves, a beanie hat and my armwarmers. My top layer was a hooded sweatshirt with another thicker sweatshirt over it and sweatpants. My breakfast was a store-bought individual bowl of apples and cinnamon quaker oatmeal. The hotel lobby had a microwave so I consumed the entire bowl at 0600 with the intention of eating another bowl 2 hours later since my wave start was at 1030. 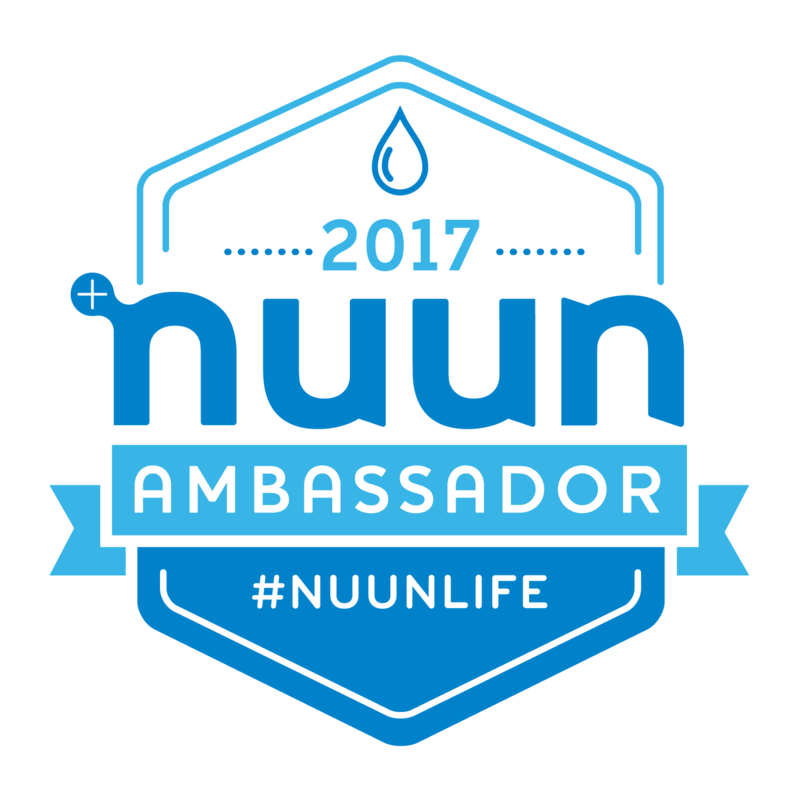 I’ve also been drinking a bottle of water mixed with Nuun tablet. On my way to the metro, I stopped for coffee and a bagel at DD. Arrived at Staten Island Ferry terminal around 0700 and my scheduled ferry was at 0730. Guess it didn’t really matter what time you took the ferry since no one even checked the time on my bib. There were a lot of people just hanging out inside to stay warm. As I was waiting I had a banana and finished my coffee. I didn’t have any more room for another bowl of oatmeal or a bagel. At 0715, I decided to board the ferry – didn’t really feel like waiting. The ferry ride offered great views of the city. I’ve been to NYC before and have had the pleasure of viewing it from a boat so it wasn’t a first for me. Still the NYC skyline is a wondrous sight. The ferry dropped us off at St. George terminal where we hop on a bus to the start line at Fort Wadsworth. There were hundreds of runners inside the terminal just hanging out – standing, sitting, laying on the floor or waiting in the line for the restroom where I decided to go instead of standing in line outside in the freezing cold for a port-a-potty. Still had 2 hours to burn so I was not in a hurry. As I waited in line, I heard the race volunteers urge the runners to head outside for the bus since the terminal was becoming too crowded. So when I had my turn in the restroom, I braved the cold and went outside to join the herd of people making their way to the buses. I made the wrong choice of boarding a full bus so instead of being comfortable in a seat, I was the one of the unlucky ones standing. A gentleman did offer me his seat but I figured it would only be a short drive so I refused, but eventually I did take his seat when he offered it again since the bus ride took more time than expected. Truly appreciated the kind gesture. By the time I arrived at Fort Wadsworth, it was already 0945, only 45 min left until Wave 3 start. First order of business though was to use the restroom again and hopefully for the final time. Luckily, there were port-a-potties galore available and I made my way to the shortest line. I heard the announcement that the orange corral for Wave 3 was open at 10am so I made my way to that area. Due to the massive amount of runners (50k+) , the start area is divided to three different corrals (blue, orange, green) and 4 waves of various start times. You can easily get lost in the sea of runners but there were plenty of volunteers to direct you to the correct corral. 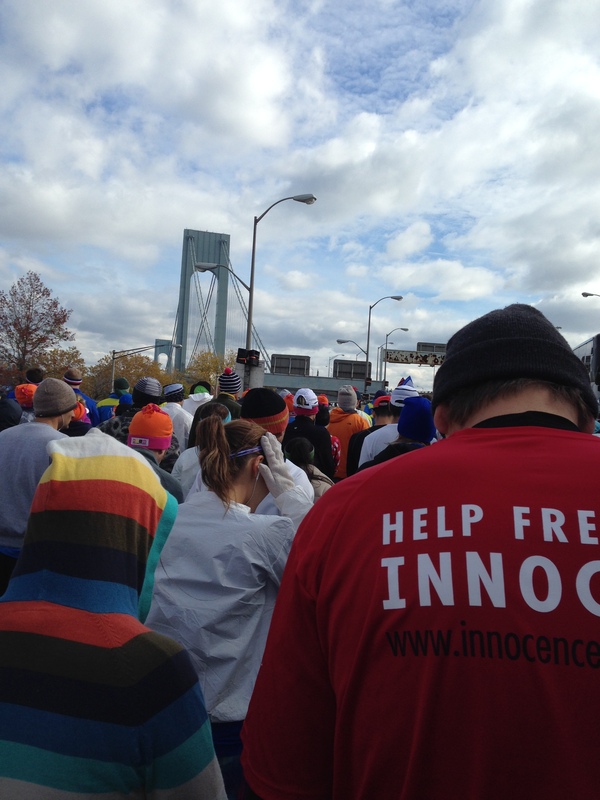 I immediately spotted the 4hr pace runner so I stood right next to her only to lose her as we exited the corral to walk to the start line which was at the base of the Verrazano-Narrows bridge. Yeah well, I have my trusty-GPS to keep my pace in check. As I peeled my thr0w-away clothes, I felt the chill in the air but was too excited to really care. My fingers were starting to feel numb (forgot my gloves) so I had my armwarmer wrapped around each hand while one carried my Iphone. I intended to take plenty of pictures but in the midst of the run, I didn’t want to fumble with my phone too much. The orchestration of the race was fantastic. Race started on the dot at 1030 after “God Bless America” was sung by a lady who sounded like an opera singer. Ready, Set, cannon blast to signal GO! With New York, New York playing in the background, it was a glorious start to one amazing race. I spotted the pacer on the bridge with a group of runners behind her. In hopes of being shielded from 30mph winds, I tried to tuck in between that group but the wind was inescapable. So my focus was to reach the top of the bridge and enjoy the scenery. Mile 2 was a nice easy downhill hence the faster mile pace. Warmed up and was hitting a comfortable pace, but quicker than my goal pace of 9:07. I should have probably backed off at this point but I wanted to hang out with the 4hr pace group. Loved the spirit of Brooklyn. Got lost in the never-ending cheers of the spectators. Oh boy, my mile splits were still too fast than goal pace. I really needed to slow down. Finally let go of the pace group. Mi10 was another downhill so I went where my body wanted to go. Although at this point, I started to feel tension in my right glute, right hamstring and right foot. Halfway point 13.1 1:57:41 Hit the half marathon marker 2min faster than my goal finish. With the way I was feeling at the halfway marker, I knew I was going to cross the finish line a little slower than planned. I stopped checking my watch and listened to the way my body felt at every mile. Mile 15 is when the race started to become a challenge. This is when we entered the Queensboro bridge. 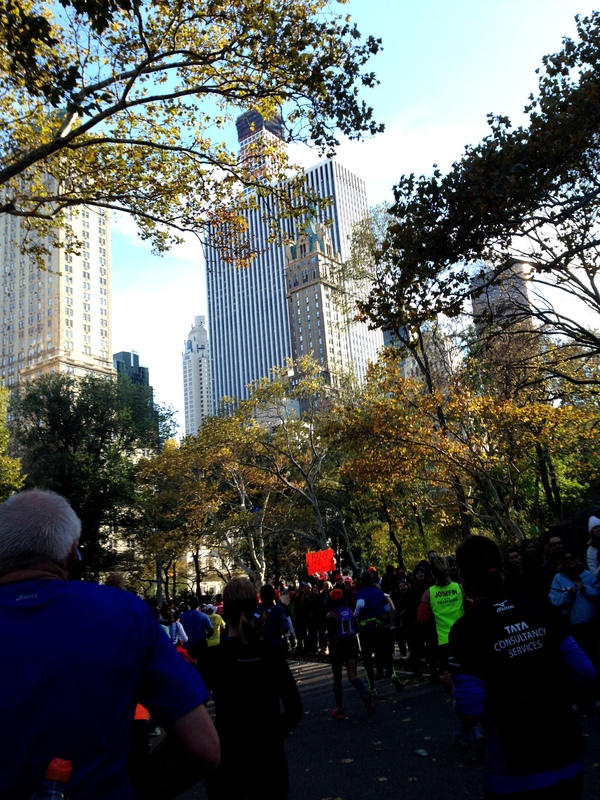 Without spectators, it was just the runners and the view of Manhattan. I felt myself slowing especially during the ascent. My lower body from my hips down to my feet were tight, but I told myself to never stop running. I told my parents to watch me from 68th St and 1st Ave around mi16-17 so this thought pushed me to keep on chugging. As soon as we exited the bridge was our first glimpse of Manhattan. By far, this was my favorite part of the race. The welcoming cheers were incredible. New Yorkers surely knew how to make you feel like a glamorous rock star! I wore a San Diego Track Club singlet and I heard people shouting “San Diego” along the course. It was exactly what my mind needed especially when my body started to feel like shutting down. Plus I was fortunate to spot my parents despite the hundreds of spectators lined up on the street. I quickly stopped to give them both a hug. A couple of miles on this course certainly made all of my discomfort disappear. If only I didn’t have another 8 miles to go. Anxiety loomed as I approached mile 20. It made me think about the WALL. I recalled a phrase I read maybe in Runners World about the WALL being a state of mind. My upper body still felt good – my energy level was up, by this time I’ve taken at least 4 GUs and very well-hydrated. So I told myself to take it mile by mile. Also at this point, many of the other runners are feeling the same way I felt of which some have decided to walk. I really had to dig deep inside me to keep running no matter how much discomfort I was feeling at the time. Entering 5th Ave, still had several miles to go but feeling quite positive about the outcome. I can see the final uphill down along the course. Not much of an elevation but definitely quite a challenge at mile 24. Elaine- you are such an inspiration to many. Keep on doing what you do. Congratulations! I’m so proud of you! Idol ! Thanks Leia! I really appreciate your comment. 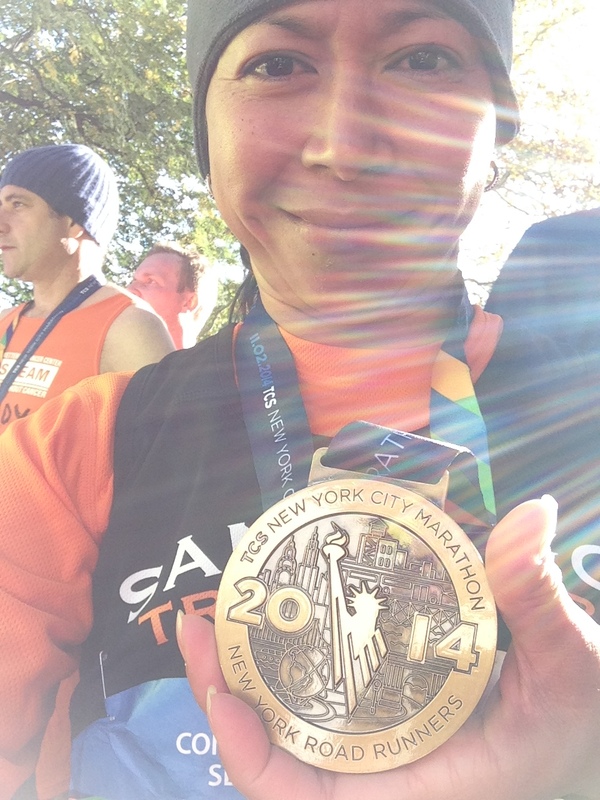 Loved running NYC!